Since November 2017, I wrote and published a blog post per day. In case you wonder, I’m not a full time blogger. This is something I do in my spare time, next to my full time job. How was I able to publish a blog post per day? To be honest, this wasn’t easy. Sure, I could write down whatever crossed my mind and call it a post. I did not take that easy path. I wanted my posts to provide value long after I wrote them. It takes me three steps to write a blog post. I explained the details of these steps in the post Four Steps to Becoming a Published Author. The fourth step is about writing and publishing a book. I decided not to take the fourth step before I built a full size audience. By a full size audience, I mean 100K Medium followers and 20K email newsletter subscribers. It’s a goal I plan to achieve in 15 months. Check the post How I Use Growth Metrics to Optimize the Stats of My Blog and Email Newsletter for more details. Throughout the time, I experimented with different tools for each step. Lately, I divided the third step into three smaller steps, as you can understand from the title of this post. We all come up with at least ten ideas every day. Some of these ideas are repetitions. Some of them are fresh insights. In either case, when the inspiration strikes, it’s important to capture those ideas. I use Evernote to capture ideas. It’s the app that I use the most. Its free version is good enough to use with a computer and smartphone combination. I have two Evernote accounts, one for my private projects, and one for my job. I can’t imagine a life without Evernote. Capturing ideas is great, but it’s 10% of the work. 70% of my blogging efforts go to organizing ideas. If you come up with 10 ideas, you end up with 70 ideas at the end of the week. Human brain is chaotic. Those ideas don’t come in a structured way. They are all over the place. I write ideas about business, blogging, my private life, and a dozen different topics. Organizing ideas involves dividing them into different notes. Then, I have to group relevant ideas in a note together. Sometimes, I have to delete duplicate ideas and the ones that I have already published. Once I have done this work, it’s much easier to write a blog post. In the past, I started to write a blog post in a text editor. I wrote down my ideas as they flowed from my mind. As a result, writing a blog post was hard, inefficient, and chaotic. I had to restart a post multiple times. Sometimes, I got lost in the middle of the post. Sometimes, I started a blog post and ended up writing another post, because my mind jumped from subject to subject. My blog posts didn’t have the logical flow I wanted them to have. I realized that I had to come up with an outline before starting to write a post. I started to use FreeMind for that purpose. FreeMind is an open source, free software. It’s great for brainstorming. I dump my ideas in there and organize them by dragging and dropping the nodes. Sometimes, many posts come out of a single mind map. You can see an example mind map in Fig. 1. 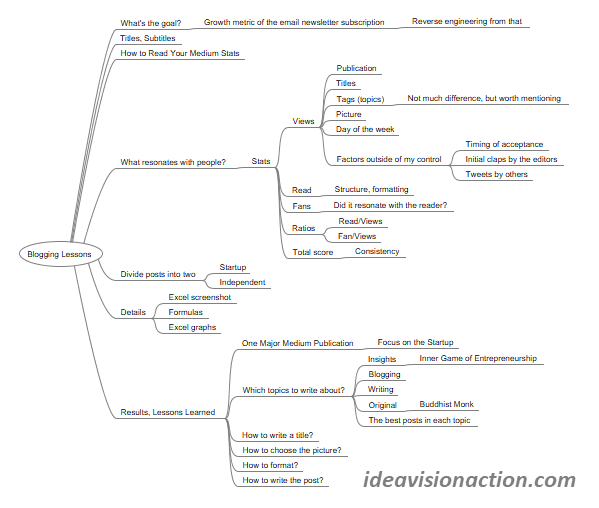 I have already written seven blog posts from the ideas in that mind map. The eighth one is in the queue. FreeMind is great to brainstorm ideas, but it doesn’t feel natural to outline a blog post. A text editor isn’t the perfect tool for this task either. I have three requirements to outline my blog posts. 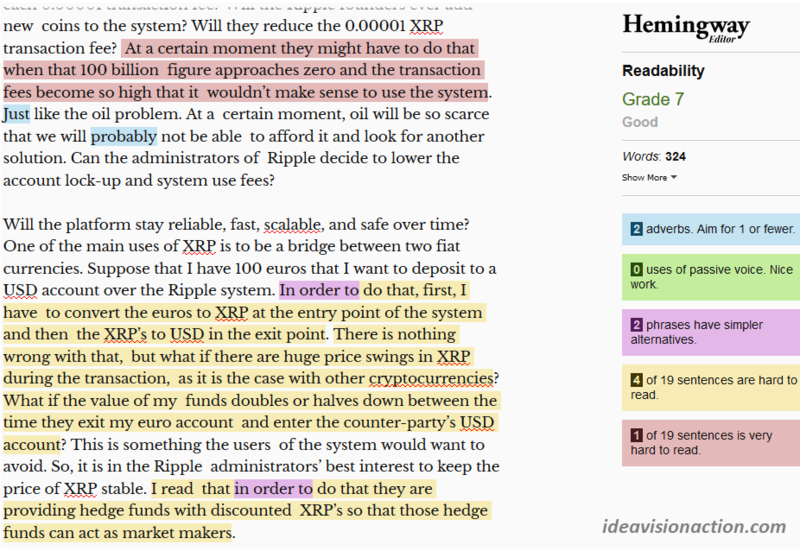 Process text naturally, like a text editor. Easily move around ideas, like a mind mapping software. Focus on a single idea, when I need to. Neither Evernote, nor FreeMind, nor any other software I know of meet those criteria. I experimented with the Guide and Scrivener for this purpose. Luckily, I came across Workflowy a few years ago. It satisfies all the three criteria above. It’s a freemium software and I use the Windows client. I have a blog post template in Workflowy (Fig. 2). Before starting a post, I duplicate that template and outline the post in that template. Once the outline is complete, I start writing the blog post. In the past, I used LibreOffice Writer to write my blog posts. I liked its autocomplete functionality. However, the advantages of MS Word outweighed the autocomplete functionality of LibreOffice Writer. So, I use MS Word to write my blog posts. I’m not going back soon. Once the blog post is complete, it’s time to edit it. I read it several times, format it, make corrections, and add pictures and links. Formatting for readability is crucial for likability of your blog posts. Check the post This Is What I Learned from My Most Hated Blog Posts for more details. I go for short paragraphs, short sentences, and occasional quotes. Like everybody, I have my blind spots too. It’s a great idea to have your blog post checked for readability. Luckily, there’s an app for that: the Hemingway App. I thank my mastermind buddy David Nowak for introducing that app to me. That’s one of the dozens of helpful tips he gave to me. If you wonder what kind of feedback the Hemingway App provides, check Fig. 3. That screenshot comes from an earlier post of mine. It was an eye-opener to get my writing analyzed by the Hemingway App for the first time. I learned a lot of lessons from the Hemingway app after the first use. I pay attention to those shortcomings. I do my best to not repeat them in the future. Blogging might look like the easiest thing to do. But publishing a blog post day after day and providing solid value in each of them is hard. I wouldn’t dare to work toward that goal if I didn’t follow a step by step process. 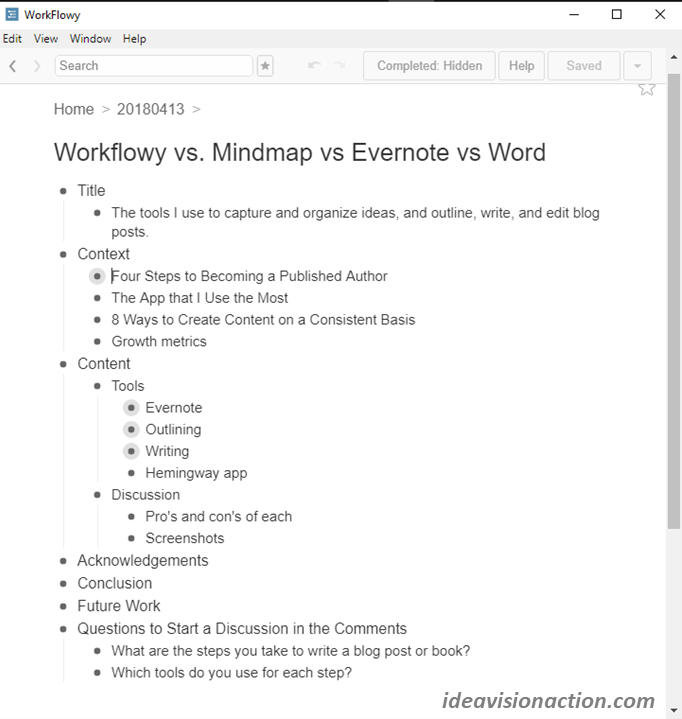 Evernote, FreeMind, Workflowy, MS Word, and the Hemingway App are the tools that enable that process. 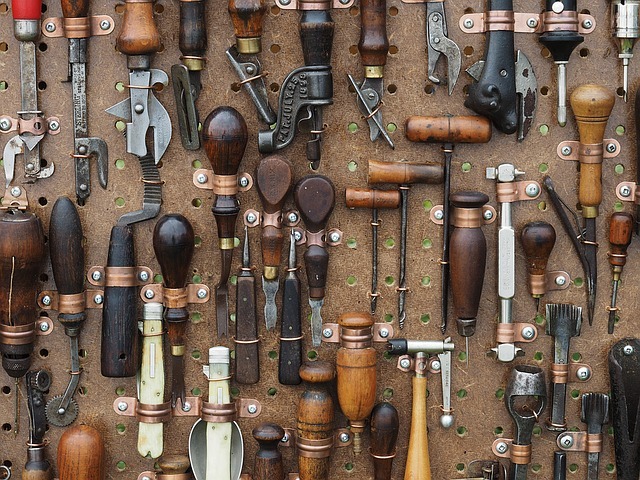 Even though I’m enthusiastic about these tools, I’m always open to new ones. So, I want to read your opinion too. What are the steps you take to write a post, article, or a book? Which tools do you use for each step? I write and leave it for a few hours then go back to it. I read it out loud and get my partner to read it. I edit accordingly. There are always edits! I leave it till the next day then re-read again. Format it. I use ‘Pexals’ for the images. ‘Content idea generator’ to help with titles. Grammarly is my Hemmingway. ‘Ask the public’ to see what the public want answers to.